The report was set to be released after the market closed, but a transcript of a pre-recorded conference call detailing the sales growth was accidentally posted online by a vendor early Thursday. Until recently, Gap has announced its monthly sales data before the market opened, but the company changed its policy this fiscal year, and now reports after the market close. Apparently, someone did not get the memo. The snafu did not go unnoticed by traders on StockTwits. Nice try bradloncar. But not quite. Despite the awkward way in which the news came out, investors seemed pleased with Gap's sales growth in February. 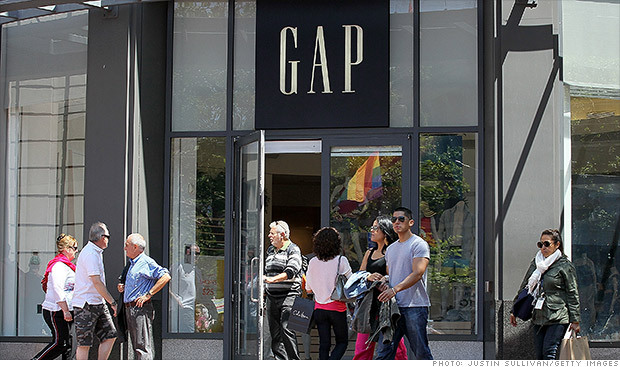 Gap said sales at stores open at least a year, a metric known as same store sales, rose 3% in February, after accounting for changes in the company's fiscal year. That's better than the 2% most analysts were expecting. Net sales rose 11% in the month. Good point. Investors have been concerned that retail sales could lose momentum as higher payroll taxes start to hit consumer spending. But, overall same store sales were slightly better than expected in February.